Summer is quickly passing us by. I can’t believe it’s already August. Before we know it, it’ll be fall, the leaves will be turning colour and falling, it’ll be getting cooler and we’ll see Christmas decorations for sale (if they’re not already!). But I’m getting ahead of myself. It’s been such a beautiful, glorious, languid summer here in Vancouver. We’ve had almost non-stop sun since the beginning of June, which is basically unheard of in these here parts. The Husband and I have been trying to enjoy every lovely moment, which means we’ve hardly been home. There’s so much cleaning that I’ve been avoiding but hey, that’s what winter is for, right? To hole up and be indoors. I’ll wait until November to vacuum, dust ‘n scrub those toilets. I’ve also been eating like a total pig. Lots of ice cream, slurpees, cold frosty alcoholic drinks, grilled meats, fish ‘n chips…the list goes on and on. Needless to say, I’ve been enjoying life to the fullest! I don’t often post savoury items on this blog but the funny thing is, my savoury dishes are the most popular! I’ve been wanting to make my own hummus for a long time now but so many things stop me (my laziness, having to drag out my food processor and then washing the bazillion parts afterwards, the fact that I couldn’t find tahini for the longest time…). I was lucky to receive a sampling of Nairn’s Oat Crackers and Cookies recently and the plethora of delicious, healthy wheat-free crackers gave me the perfect excuse to make the hummus. I’ll be honest – I had plans to do some baking with the cookies but they were so delicious I ate them all myself, in rapid succession. The dark chocolate was my favourite (naturally) but the ginger and cranberry cookies were fabulous too. If you’re big fan of ginger, I highly recommend Nairn’s cookies. They certainly don’t skimp on the ginger flavour. Nairn’s is an independent Scottish company based in Edingburgh, founded in the late 19th century. Today, it’s the leading producer of oat-based products in the UK. I love that Nairn’s products contain no wheat, which gets digested quickly by our bodies, unlike oats, which helps us sustain energy, feel fuller for longer and helps control blood sugar levels. Plus, none of these contain trans or hydrogenated fats, genetically modified ingredients, artificial colourings, flavourings or preservatives. That’s a win for my arteries! Good news for my fellow Canucks – these products are available at all major grocery stores across Canada, including Loblaws, London Drugs and Whole Foods Market, just to name a few. I’m hunting for more of the dark chocolate cookies. With respect to what you can do with the oat crackers, the sky’s the limit in terms of toppings. I wanted something savoury and healthy, therefore I finally pushed myself to make hummus. This is by no means a traditional hummus recipe. The beauty is how adaptable this is. Drain and rinse the chickpeas. If you want, you can remove the skins from the chickpeas for a smoother hummus. Place the walnuts into your food processor and process until it breaks down to a pebbly, crumbly texture. Add the rest of the ingredients to the bowl of the food processor and process until very smooth. Scrape down the sides of the bowl as needed. Taste and add more of any of the ingredients to taste. If the hummus is too thick for your taste, add more lemon juice or olive oil to thin it out. Scrape the hummus into a bowl, pour a bit of olive oil over top and enjoy, with crackers, bread, pita, veggies, whatever you want! My hummus wasn’t as smooth as I wanted but it was still delicious. Thick, garlicky, salty. Perfect on top of these oat crackers. Disclosure: I received 7 sample boxes of Nairn’s oat crackers and cookies to review. All opinions are my own. Nancy – this sounds wonderful! And guess what? I have a walnut tree in my backyard too! Now I have something to make with it. Hi Nancy, love how this hummus sounds and looks, I bet it is delicious! Nancy, sounds like you had a lovely summer, so glad to hear that. Blazing hot here in LA, I could have used some of those frosty drinks you were talking about. The hummus sounds so good. We are big hummus eaters here at my house so I’ll give the recipe a try. Please don’t even mention it! I’ve been eating like a cow! I think its because ” its summer” is such an awesome excuse to stuff our selfs! Going back to this recipe, my fiance is going to LOVE it! Trying to compete with me in the savory category, huh? LOL Hummus has been on my to do list too so congratulations on beating me to it. It looks delicious. BTW, you talk about summer ending but in 2 weeks, you’ll be able to walk into Macy’s and see Santa Claus. Wow–for once I think I’m jealous of a store item you folks do have and we don’t! This looks crazy good: and of course, sampling is always super fun. I liiiiive for hummus. I’ve been deterred from making it again because the flavor never seems right, but I’ll give your recipe a go! I really love hummus but have yet to try making it at home. Not sure why but must be that lazy thing you talked about dragging out the food processor. But you have motivated me to try it soon!! These crackers look delicious…oats always keeps one fuller longer! Hope you and the hubby continue enjoying the summer!! And thanks for reminding me I don’t have to clean till November lol! Nancy, your summer so far sounds exactly how it should be. . enjoying life to the fullest and just living in the moment! love it! and hello?! this hummus? LOVE the addition of the walnuts! never done this before in hummus and will definitely be trying this soon! and will have to check out Nairn’s .. the oat cookies and crackers sound fabulous!!! The hummus looks insanely delicious Nancy!! I love hummus and I love the roasted garlic first before blending. I can only imagine the amazing smell and flavor it provides! Yeah, I’m freaking it’s already August…I can’t believe Christmas is around the corner already! My little Olivia will be turning 3 in October….I can’t believe it! Hell yes! Homemade hummus is so great, because you can add whatever you want. I actually haven’t made a batch in a looooong time, but I need to get some more tahini and get on that. I have a HUGE bag of walnuts in my freezer, too. I don’t think I would have ever thought to add them to hummus, but I’m loving that idea! P.S. I’m way too lazy to take the skins off the chickpeas. Do people really do that? Looks delicious Nancy, I would eat this with a spoon! Love hummus so much! yur hummus looks amazing. Never tried hummus with cheese, what is the taste like? You shut your mouth about those Christmas decorations. If I see a plastic Santa in September, I might just have to punch him in the face. (I don’t like stores rushing my holidays…in case you couldn’t tell). On a positive note, THIS HUMMUS. Give me a spoon and I’ll be happy. I know, right? I could have SWORN yesterday was June! As for hummus.. I have only ever tried it once. I know. What is wrong with me? This looks amazing! This looks so delicious. Would love some for my rice cakes. Emma. I love walnuts! Never thought to add it to hummus, so wooooo! 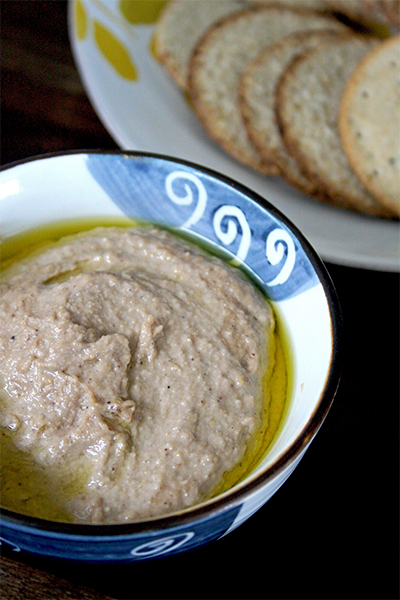 Love the extra olive oil you put in…because the best hummus I had was ultra creamy with nice olive oil! I like hummus with crackers, pita bread, flatbread, burrito, and anything else, such a versatile spread! Yum! I love hummus so much and these crackers look good with it. I like the walnuts in this recipe! I am sure you know this, but it very easy to make tahini 🙂 I have never bought it myself.